Information Please feel free to browse our information below regarding our delivery schedule, pricing information, and frequently asked questions regarding tanks. You may also call or e-mail us with any and all questions. Below is a table containing the zip codes we service on a given day. For Will Call customers, please make sure you call at least 1 day prior to your delivery date, as we do not generally service tanks from Will Call customers who call in the same day as their delivery date. Under a lease, D&D will repair any problem related to the tank and even reimburse certain expenses such as lost gas due to failure of a part. If you own your own tank, you will be responsible for any charges associated with repairing issues, and you will not have lost gas compensated. For questions regarding our current pricing programs, please call us at 904-725-9144. 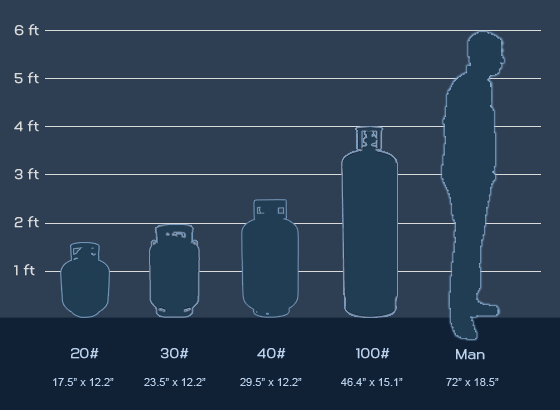 Below is a chart showing you the relative size of tanks in comparison to a 6-foot-tall man. Tanks are good 12 years from date of manufacturer, and then must be recertified. Due to other factors, a tank may need to be recertified sooner. Below is general information regarding each of the common tanks brought in to our facility. All of the cylinders listed are filled by weight following a free tank inspection. You will notice you are able to use higher-capacity tanks with more appliances.